On RS rows, slip stitches with yarn in back. 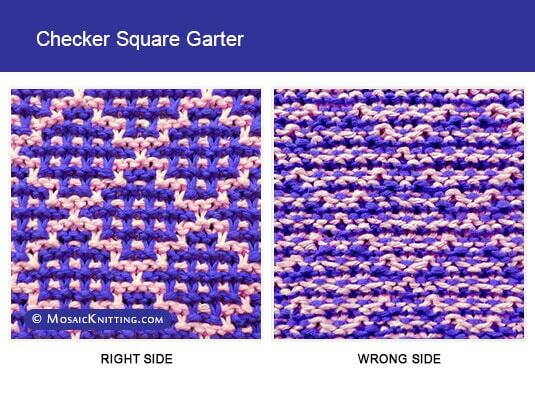 On WS rows, slip stitches with yarn in front. Color A, cast on a multiple of 12, + 3 and knit one row. Row 1 – RS : Color B, K1, * SL1, K11; rep from * to last 2 sts, SL1, K1. 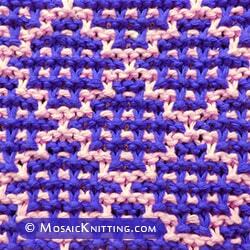 Row 2 and all WS rows: With same color used on previous row, knit the purl stitches and slip the slipped stitches as they face you. Row 3: Color A, K4, * (SL1, K1) 3 times, SL1, K5; rep from *, ending last rep with K4 (instead of K5). Row 5: Color B, K3, * SL1, K7, SL1, K3; rep from * to end. Row 7: Color A, K2, * SL1, K3, SL1, K1; rep from *, to last st, K1. Row 9: Color B, K5, * SL1, K3, SL1, K7; rep from *, ending last rep with K5 (instead of K7). Row 11: Color A, K2, * SL1, K1, SL1, K5, (SL1, K1) twice; rep from *, to last st, K1. Row 13: Color B, K7, * SL1, K11; rep from *, ending last rep with K7 (instead of K11). Row 15: Color A, rep Row 11. Row 17: Color B, rep Row 9. Row 19: Color A, rep Row 7. Row 21: Color B, rep Row 5. Row 23: Color A, rep Row 3.